Although it's the most popular cruise ship port of call in Scotland, Invergordon might look a bit bleak as you pull up to the dock. Its main industry is repairing oil rigs, which are towed into Cromarty Firth, so there's little glamour to the waterfront. But the town's natural deep harbor (carved by glaciers) makes it the ideal cruise portal to the Highlands. Once ashore, you'll probably head out to see the Loch Ness monster, Culloden Battlefield, the town of Inverness, a castle or perhaps a whisky distillery. Because most visitors scurry off to the heather-covered Highlands, this town of about 4,000 is less touristy than you might expect, and it owns a homespun charm. When we visited on our Windstar cruise, a handwritten sign greeted us at the little tourism kiosk: "Welcome Wind Surf! 100% guaranteed sighting of Nessie tomorrow!" Take a short walk into the town center and you'll find impressive murals, overflowing flowerboxes, small shops, cafes, banks -- and friendly people happy to have a wee chat. Don't forgo a shore excursion to hang out there, but if you have an extra hour or so, you can have a pleasant time seeing the murals and poking around High Street. The town seems thoroughly genuine and blissfully short on jaded tourist glitz. One of the best memories of our cruise was being played off during our sailaway by an 18-member high school drum and bagpipe corps in full Scottish regalia. Their haunting music carried out over the waters as we sailed off through the firth. When you disembark, there is a pier, about 750 feet long, to walk along to reach the shore. Any excursion buses will be parked there. A five-minute walk takes you a bit uphill to High Street, the town's main business street. Just keep walking straight ahead from the pier and you'll hit it. There are several ATMs, a pharmacy, cafes with Wi-Fi and a post office inside the SPAR store. There's no cruise terminal at the pier, but you will find a souvenir shop with a tea room, taxis, tour company signs with prices and phone numbers, and a large placard with a map of the town. Tourism representatives sometimes come aboard ship to offer information and maps. There's also an information kiosk on the first road you'll reach if you continue straight off the pier toward High Street. It's not staffed full-time but should have someone there when you first come ashore. Either way, there are maps, lots of brochures for attractions all over the Highlands and a signboard with thorough bus and train information. If you walk left when you hit shore, you'll be headed toward an industrial area; to the immediate right is a nicer area and waterside pathway. If you decide to drive, remember that the Scottish drive on the left-hand side of the road. Be particularly careful when you make a right turn, because you have to cross oncoming traffic. Be a cautious as a pedestrian, too, when crossing streets -- though Invergordon doesn't have much traffic to worry about. 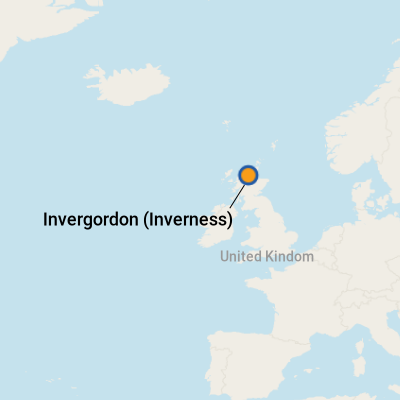 On Foot: You can pretty much stroll to any place of interest in Invergordon, but to head for the Highlands, you'll need to organize transport or sign up for an excursion. By Train: It will take you about 15 minutes to walk to the Invergordon train station. Head for High Street, then turn left. Toward the end of High Street, the train station will be to your right, down Station Road. A 50-minute journey gets you to Inverness; an hour and 20 minutes will take you to Dunrobin Castle (a request stop). Service to Dunrobin is limited, and there are no trains to that destination on Sundays. ScotRail train schedules are posted in the tourism kiosk. By Bus: Buses can also take you to Inverness, with a connection onward to Loch Ness. It takes between 45 minutes and one hour to reach Inverness (depending on which route you take), and then after a change of bus, it's another 45 minutes or so to reach Loch Ness. You can reach the charming little town of Dornoch in about 55 minutes (no Sunday service) and Tain, home to Glenmorangie distillery, in about 35 minutes. Bus schedules, through Stagecoach Bus, are posted in the tourism kiosk. By Taxi: Taxis should be waiting at the pier, and four companies offer taxi or private-car touring: Scotland Taxi Tours, Invergordon Shore Excursions, Invergordon Tours and Highland Classique Tours. All have set itineraries or will do custom tours; they provide four-seat cars or six- to eight-seat vehicles. By Rental Car: You can rent a car to drive yourself from Ken's Garage (+44 01862 842266; Jane@KensGarage.co.uk). Book in advance to have a car waiting for you at the pier. The pound is Scotland's currency, comparable to -- and interchangeable with -- the British pound. For currency-conversion figures, visit www.oanda.com or www.xe.com. A few shops in Invergordon will accept U.S. dollars and euros (SER Supplies, for example), and credit cards are usually accepted, too. There are no ATMs at the port, but you'll find several along High Street, including at the Royal Bank of Scotland (RBS) and the SPAR convenience store, both on High Street -- a five- to 10-minute walk once you're onshore. Bank hours are 10 a.m. to 4 p.m. weekdays. English is the primary language, but you may have to listen closely because of the accent (unless you're a "Star Trek" fan, practiced at deciphering Scottie's speeches). Gaelic is spoken by 1.2 percent of the Scottish population, but most Gaelic-speakers live on the islands. Traditional Scottish dishes include the renowned haggis -- sheep's heart, liver and lungs, minced with onion, oatmeal and spices, cooked in a sheep's stomach and traditionally served with a shot of whisky (for courage, we suspect); tatties and neeps (mashed potatoes and turnips), black pudding (blood sausage with oatmeal); and a less-scary assortment of baked goods, including scones, shortbread and oat cakes. Invergordon is surrounded by rolling farmland and, though they're modest establishments, even the High Street cafes proudly list the sourcing for many ingredients. A boggling number of bottled Scotches can be found at SER Supplies Superstore (131-133 High Street), including airline-sized bottles that make it easy to sample a wide array and see what you like. Quality tartan plaid blankets and an interesting assortment of handmade walking sticks, some with antler handles, also are among the popular items. You'll find Celtic jewelry aplenty at M.A. Forbes Jewelers (106 High Street), and the prices were comparable to what we found elsewhere in Scotland for similar pieces. When in Scotland, go for the Scotch! There are many whisky labels that never make it to the United States, so sip and experiment. A pleasant spot to relax with a whisky (no "e" in Scotland) is Tuckers Inn (11 Saltburn Road; 01349 852335), to the right of the pier, about 200 yards along the waterfront. Or visit one of the two local distilleries (see below).